Many may consider 42 year old, Dwayne Roloson, past his prime. 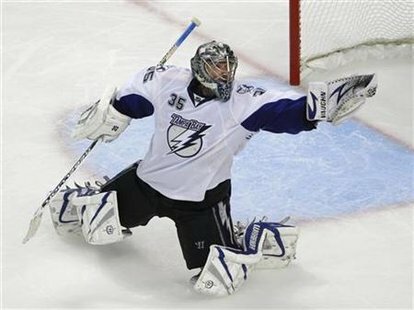 However, after he was traded to the Tampa Bay Lightning last season he silenced some of his critics by anchoring the Lightning in net and helping the team make it to the Eastern Conference Finals. Roloson came into the league undrafted, and has played for a hand full of teams since coming into the NHL in 1996. Roloson has spent time with the Calgary Flames, Buffalo Sabres, St. Louis Blues, Minnesota Wild, Edmonton Oilers, New York Islanders, and Tampa Bay Lightning. He has appeared in 566 games, winning 214, while posting a .910 save percentage, and a 2.56 goals against average. Although Roloson has not produced Patrick Roy or Tim Thomas numbers, he can't be entirely blamed for that, look at some of the teams he has played for. Not the cream of the crop. However, Roloson has still turned out some amazing saves in his career, one being against the Montreal Canadiens last season. After Montreal Canadiens' forward, Michael Cammalleri, sent the puck to the slot the puck bounced off of a Tampa Bay Lightning defense man back towards the net. Roloson then jumped off the post and batted the puck out of the air before it entered the net. Maybe you can teach an old dog new tricks. Maybe if Roloson had more of a supporting cast through out his career, saves like the one above would have been a little more valuable and got him a trophy or two.